I still can’t believe I found it at Goodwill for only $24.99. It was disgusting though. Totally gross and grimy and icky. Just take a closer look. There was a logo on the glass I had to scrape off as well as a few stickers. The entire machine was really dusty and grimy. Would you eat candy that came out of that? I’m not sure this machine ever got cleaned after it was manufactured in 1984. 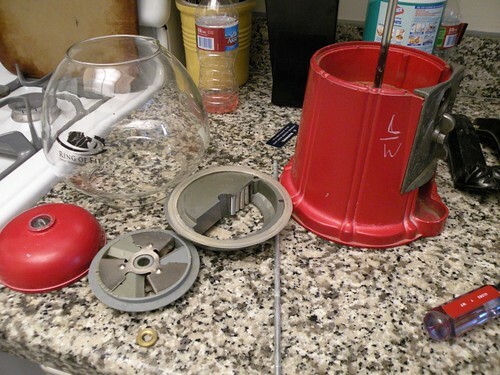 I really love this gumball machine though so I just took a deep breath and started taking it apart. I heard some rattling around inside it when I bought it and figured there had to be some money in there. Sure enough, money! But would you want to touch that disgusting nasty mess with a ten foot pole? The money was mixed in a layer of ooze, grime, and what looked like little rabbit poop raisins at least 20 years old. I literally gagged when I had to touch it. 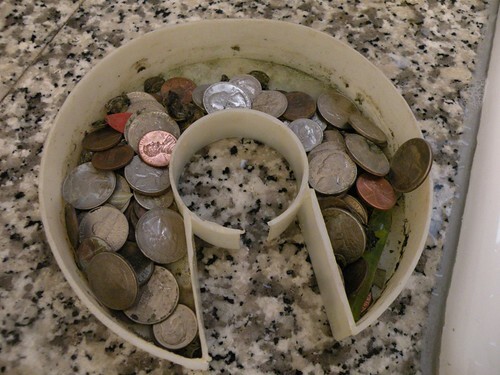 I dumped all the money into a colander and just covered it with soap and washed it while I picked out the gross raisins. Totally filthy, but this machine is SOLID. It is heavy and metal. It was obviously an industrial machine that was meant for a store. I can totally picture it at a Jiffy Lube or a dry cleaners. They are ready for their bath! Here are all the pieces after I gave them a really good washing with a toothbrush. 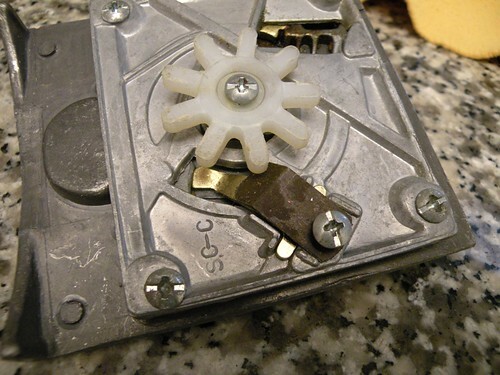 This is the back side of the piece where you insert your quarter. The bronze tab you see is what makes it accept money or not. 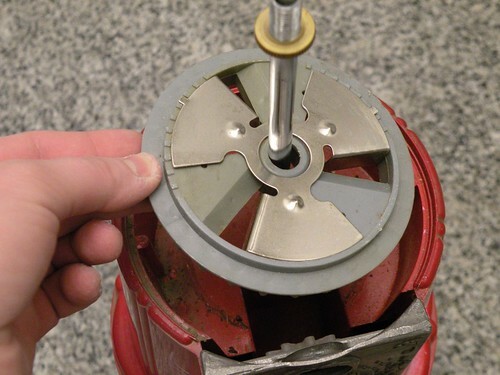 If you want it to work without quarters just remove that little piece. 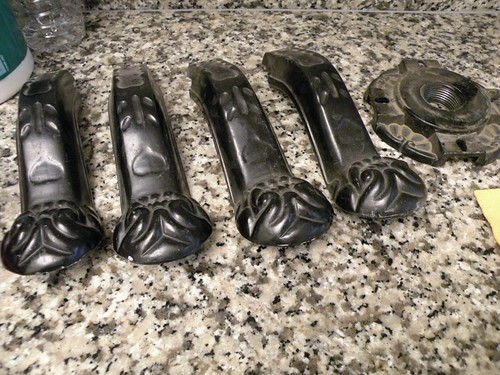 After cleaning and washing all the pieces I took them outside and gave each one a fresh coat of either semi-gloss Black or semi-gloss Apple Red spray paint. Here she is! I decided to not paint the silver front where you put your money. I like it better the way it is. I am so in luurrrrve with my new baby. Now all she needs is some candy! Ahh, much better! Nothing like Jelly Belly to make the world a better place! Ah-mazing!!! 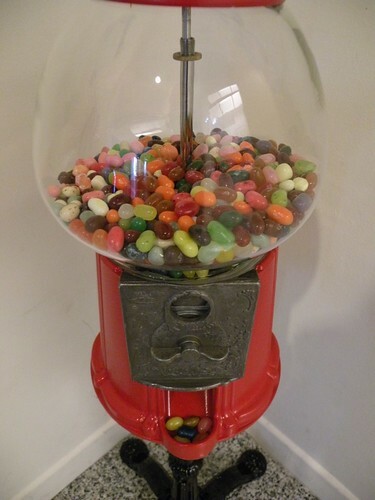 I was going to rig it so that it didn’t need money, but my hubby thought that the kids having completely free access to unlimited jelly beans might not be such a great idea. Good thinking! 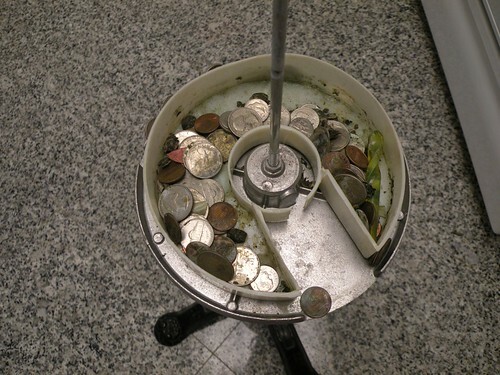 Remember that money in the bottom of the machine? I paid $24.99 for the gumball machine and then found $8.99 inside it, so my total cost for the machine (minus the candy and spray paint) came to an even $16! Not bad, not bad at all. Did I mention that I’m in lurve? Kari, that was a fast reply!! If I see another one (hey, I might!) I’ll buy it for you. I would SOOO be keeping a role of quarters in my pocket (or a screwdriver on hand). Looks adorable!!! I want one for my classroom – when I get one. 😕 I could keep cool erasers or pencil toppers in there. WOW! My 3 year old would LOVE that. Heck, I’d love it! Fabulous find at an amazing price. Enjoy! I love seeing people refirbush old items. It’s very GREEN of you!! Love it! What a patient person you are, to deal with the ickiness what it once was! I think having kids pay for their candy will help them learn the value of a dollar. ;)- It would also keep me from eating all the candy myself! Awesome job – my wife is so talented, isn’t she? I totally NEED one of these. But, I may fill it with m&m’s. It looks great! Okay, 2 things…that is FABULOUS!!!!!!! First, it looks so cute and classic and vintage, WOW! Second, my kids will NEVER get another gumball AGAIN!!!!!!! HOLY FREAKIN’ MOLY!!! SOOOOOO cute!!! 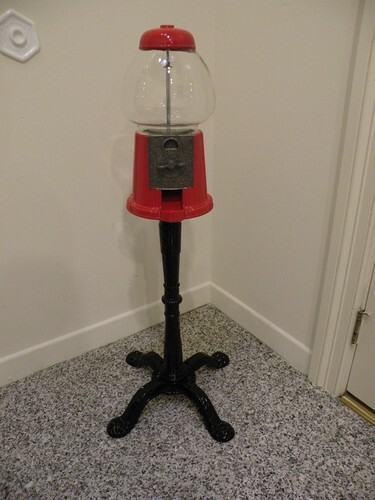 It makes me wish that I had an old gumball machine to spruce up. You DEFINITELY scored with this one. Thanks for joining my party!! Hope you come back next week!! That is awesome! I want a candy machine now because I LOVE SUGAR!!! I can’t believe there was $9 in it. What a deal!!! Eew! 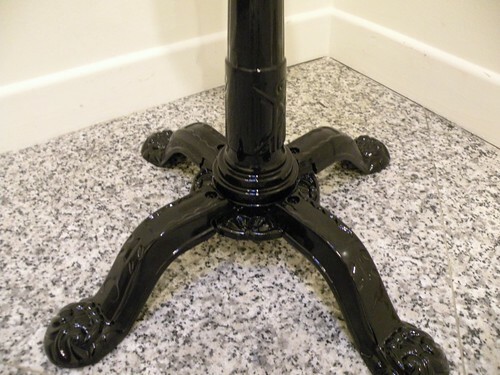 The finished project is great, but that money… I probably would have made my husband clean it. Cause that’s how I roll. Thank you for linking this up to A Little Craft Therapy with Life in the Pitts. I love this! What a great find & it turned out beatifully. I just found your blog from all things creative and i am thinking any girl that can make a nasty candy machine shine-then i must look at the rest of your blog! I also love your header! Can’t wait to look around! If you have a minute-please stop and say hello! wow..look what a little TLC can do! Amazing…totally inspired! I love that! You definately are a professional thrift shopper. I haven’t seemed to master it yet. Can’t wait to see what you do with some of that other stuff. Thanks for stopping by my blog with a comment. Oh my – I honestly thought you were going to pitch the change that was left over – especially when you said you were gagging. Hats off to you! That’s a great deal. You did such a good job with it. That is a great candy stand – I love it. I remember visiting a few Irish pubs in NYC as a young one, being handed a nickel, and finding a treat. Usually red pistachios! I’m in lurve too… FABULOUS! we have a friday fun finds party… if you’re interested, we’d love it if you’d link up this week! Lovely! 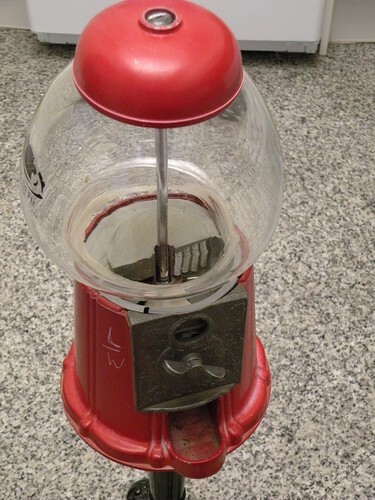 I had a gumball machine when I was a kid and was very popular on the block! What a lucky fabulous find! I lurve it too…I want one too!!!! Wow! That is cool..and what a great deal. Definitely not bad at all! Well worth the effort–it turned out great and I love that you put jelly bellies in it. Thanks for linking up! Oh I love those! I want one!! Oh my goodness, I love it. Not a fun job to clean it up, but the results are fabulous!! What a fun find! It looks brand new now… Great job! Thanks for sharing it at the Power of Paint Party (POPP). Oh my that was gross! That is very cool. You did a great job and you can’t bet the price. Oh, wow, that would be soooooo dangerous in my house. I’m a candy addict. Looks great! WOW! What an incredible find!!! That was a great find! It looks fabulous all cleaned up and repainted. Great job going through all the yuck to get such a nice piece! LOVE it! Jelly Beans just in time for EASTER! So fun and I can’t believe how good it looks all cleaned up and painted…very cool! Great find! And how awesome is that price? I’d say you were paid to clean that grossness in the bottom. Ick! I love this!!! What a great job you did making it look so beauuuutifull! Awesome!! 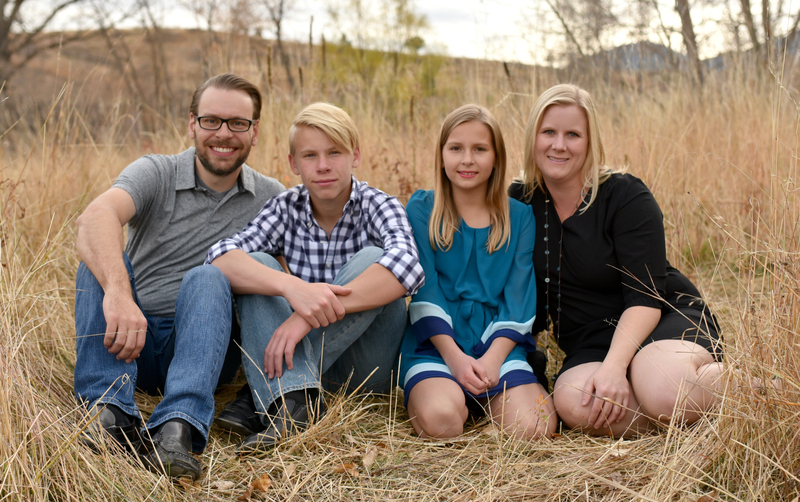 Your kids have the coolest Mommy on the block. I don’t know many that would go through all that work to make a jelly bean machine for their kids, it’s so fun! Thanks for sharing. 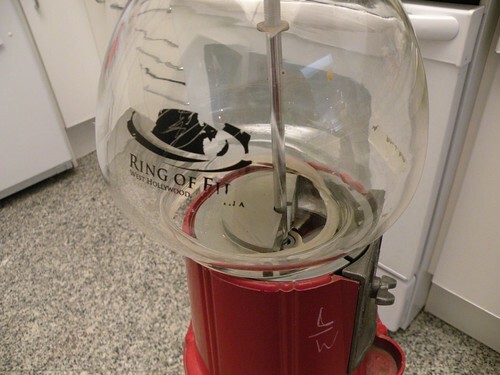 i love this – i am home visiting my parents and just commented to my dad that i wanted to ship back my old gumball machine that is still in their basement – i love the look of them and my girls are obsessed with gumballs. great job! My daughter lugged home a gumball machine just like that from a yard sale. 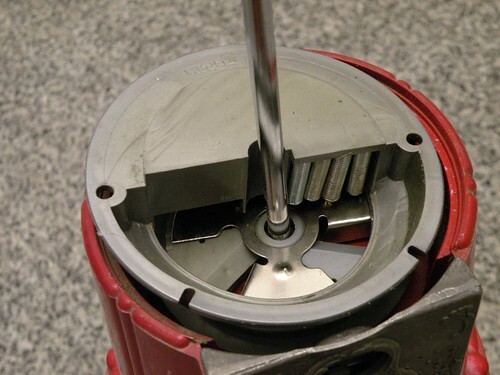 Only hers is missing the entire coin mechanism…D’OH! Not sure what I’m going to do with it. Right now it’s hanging out in our garage. I love it! 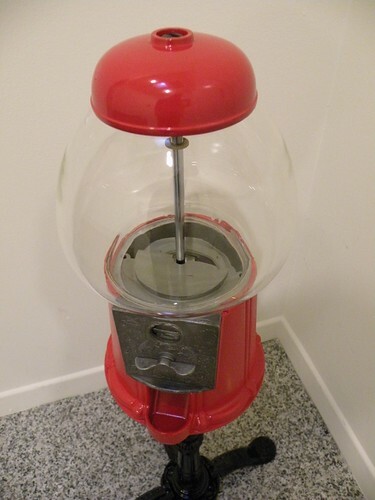 I just found my childhood gumball machine and cleaned it up. It’s not on a stand though. Yours is AWESOME! This is so cute! I LOVE it. Keep crafting and sharing. WOW!! I love this! It is SO beautiful! (after the good washing and gaggin!) I was curious how much was in there so I am glad you mentioned it haha What a treasure!! Thanks for sharing at Spring has Sprung at Fun to Craft! 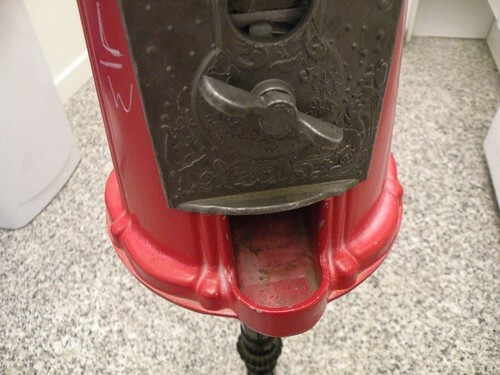 You were brave to take on the job of cleaning that gumball machine but it really turned out super awesome! Great job!! This is something I would have wanted if I had seen it at the Goodwill store but probably would have passed on it. I’m not the kind of person who can take stuff apart and put it back together. I haven’t yet been able to master this. Once it’s apart, that’s the way it stays….lol Thanks for taking the time to post all of these photos—the detail with the photos really completes this story. I love it!! 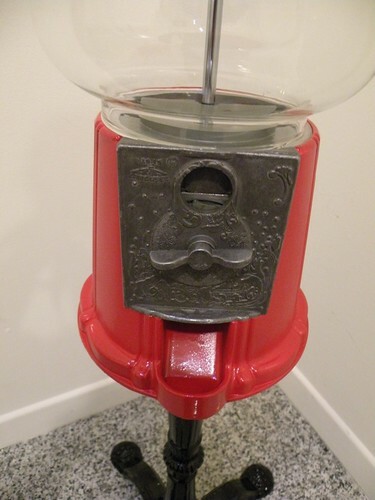 I redid an old candy machine last year, and I let my kids do jobs to earn quarters. It’s amazing what they’ll do for 5 m&ms. Pretty funny actually. I think they just love the experience of putting the money in and turning it. Anyway, it’s been the greatest way to get things done around here!! Great job fixing it up. My son has the identical one and he loves it. Thanks for joining Get Your Craft on Thursday. Please join me next week for another great party. Don’t forget to stop by and enter my giveaway. I’ll announce the winner at next weeks party! Happy Friday Follow! I’m your newest follow. You did a great job. 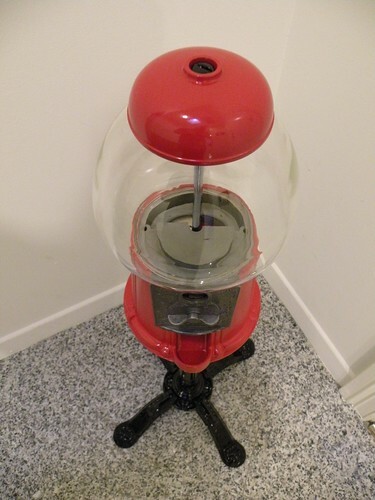 I might be inspired to put my husband’s gumball machine (that he has had since childhood) out for display. Thanks for the inspiration. Wow – that is seriously cool. My kids would love that so much! OMGoodness! I LOVE it! I am SO jealous!!! SO AWESOME—I would have grabbed it too. I saw someone make one into a fish tank but it was just a table one. What a treasure. My sister’s sister-in-law got one the night she got engaged. She had always wanted one and he got it and put her ring in. He gave her a quarter to get a piece of gum and out came her ring. Wow what a find! I would love to find something like that, it’s awesome! I have one that is completely restored for $50obo. Went with black and yellow for steelers colors bit everything else is original. It is awesome god!!! Such a brilliant idea!!! What a lovely find!! I’m jealous….I want one and a candy shop register soooo badly! Great find! 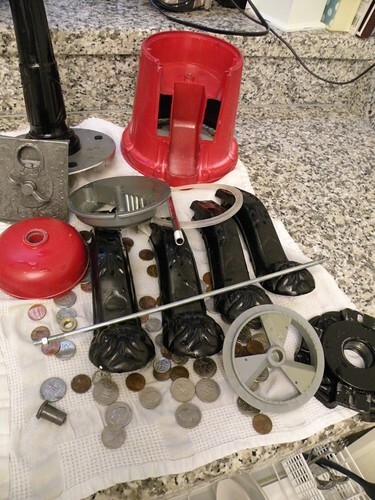 I know you already cleaned yours, but if anyone else finds a yucky gumball machine, you should know that you can take them apart and put the parts through the dishwasher! 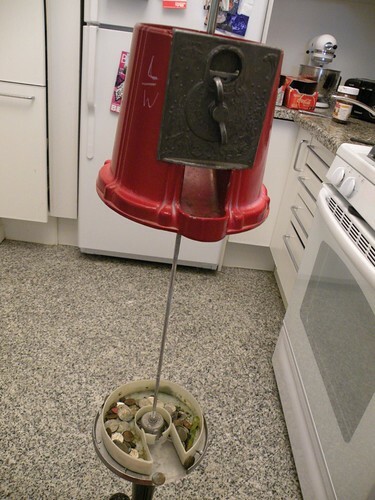 I have a collection of old red metal gumball machines that I put out every Christmas with red and white candy in them, and before I put them out I always run them through the dishwasher. Just be sure to put the plastic inside pieces on the top rack and turn off the drying feature on the dishwasher. Mine have never chipped or melted. Have fun! Ha ha! I can’t believe Goodwill didn’t take the money out. And don’t you hate how many stickers they put on everything??? Anyway, as I was reading, I thought that’d be something cool to display a marble collection in. That is so funny that there was money inside! 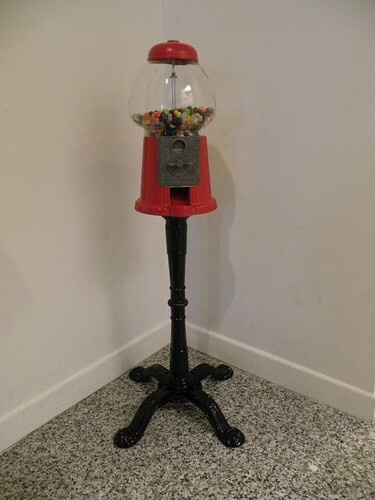 I had that gumball machine when I was in 6th grade and I thought it was the coolest thing ever. Candy on tap in my room! I recently fell in love with a three section candy vending machine at a local antique shop. Even on sale it was $160 but oh I want it so badly! What a great find! It looks so nice all cleaned up. I love that you found money inside too! Beautiful! You worked so hard on this; I’m really glad you got some money back for all your efforts! My kinda craftin’ ! I want a tabletop version of these to put buttons in! I will keep my eye out! Haha I almost died laughing at this post. I bought a smaller version minus the stand on ebay & I think I was saying the exact same things you were as I took it apart & scrubbed it. I found you on Savvy Chic. We have that exact machine. It was my husband’s grandparents. They had it in there TV repair shop. It doesn’t work. Do you know how we could make it operational? Jealous again!! I want one of these so badly. You have a great find. guess i’m a little late seeing this one,, my daughter and I found one like this for $1 one year at a yard sale and it too had money in it so we got if for free really. But now it sits on her carport all neglected,,, but since i’ve seen yours i might try taking it apart and making her pretty and useable. Hi I was trying to fix my machine which had a penny stuck in it. I now have a v-shaped black spring that goes inside the money accepter. Just wondered if you could help. Just need to know where it goes. 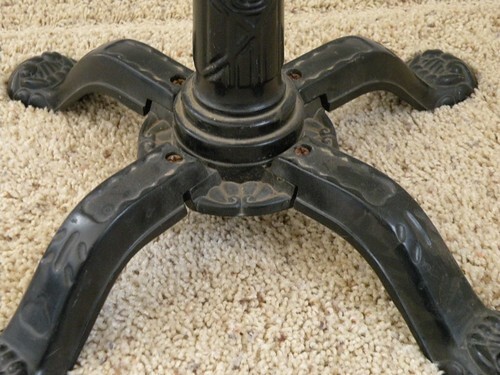 I just bought one off craigs list TODAY for $25…looks just like this! It is pretty clean, too (sorry) I am so excited to fill it with candy and charge my kids and their friends! This is sooo beautiful! I wish I could find one at MY Goodwill, you lucky duck! Wow! Ewe! Nice! Yuck! Cool! I so love it, but don’t envy your hard work! Congrats! It is a beauty! I love it and I know Kaelyn, my 4 year old, will too. I will be on the look out for one of my own. I’ve got a gumball machine too! I always have rubber gloves on for projects such as these ! I just bought one from goodwill for 3.00 mine was already cleaned the same exact one!!!!!! No fair! So awesome for you though! !